My earlier post automate-building-your-own-atomic-host describes how to Automate building Atomic Host with Ansible. But it is not capable of customizing packages for OSTree and build Atomic host based on it. Add packages to OSTree (It is suggested not to delete any pre-existing packages from the OSTree, that might break your Atomic host). No need to create VM from the QCOW2 image will shell script anymore, It will be now all-in-one playbook. If you do not know about Atomic host, please refer to http://www.projectatomic.io. The requirements remain the same just like the earlier post. I will use Fedora distribution for the demo, but the same will be applicable for CentOS as well. Make sure Ansible is installed on your system. If you are using Fedora workstation/any other platform, do not forget to install python2-dnf as well. Download Atomic QCOW2 image: Fedora-Atomic. The following will install requirements on your system, initializes OSTree and starts HTTP server as daemon service. The OSTree is made available via web server at TCP port 35000. After running the playbook you may use ip addr to check the IP Address of your HTTP server. I am going to use variables applicable for Fedora. If you are using CentOS please modify the variables based on it. Additional packages you would like to have in your OSTree. abs_path: /workspace                                # The absolute path to the git repo. custommanifest: customized-atomic-docker-host.json  # The manifest that goes into the custom host(ostree) content that we are going to build. 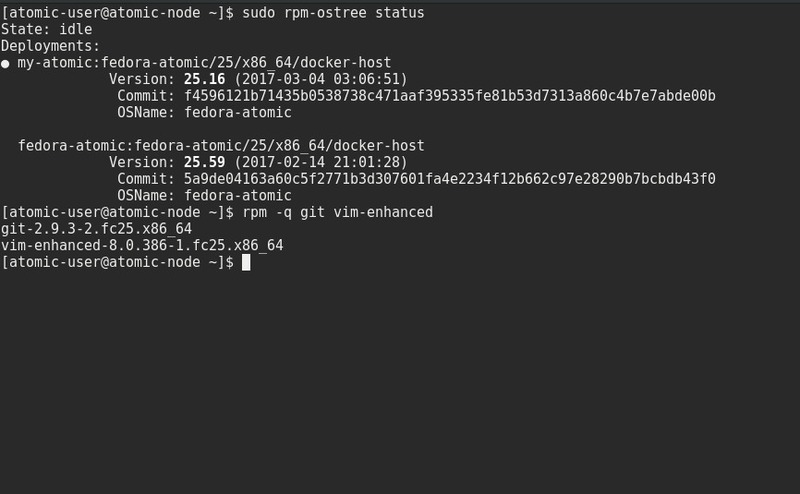 sourcemanifest: fedora-atomic-docker-host.json      # The manifest that goes into the actual Base Fedora host(ostree) content. packages: '"vim-enhanced", "git"'                   # Packages you want to have in your Atomic host. Add packages like above separate by comma. Note: user-name: atomic-user, password: atomic are the credentials for the instance. If you wish to change it, modify the cloud-init user-data. We will have the credentials as variables/vault later. Now SSH to the Atomic host and perform Reboot so that it will reboot in to custom OSTree. SSH again and You will have your own OSTRee. If you find any bug/idea please open up issues here. Thanks.